We dedicate our breath, passion and love to the wood. Therefore a voice of our guitars is one of the most beautiful sounds in the world. 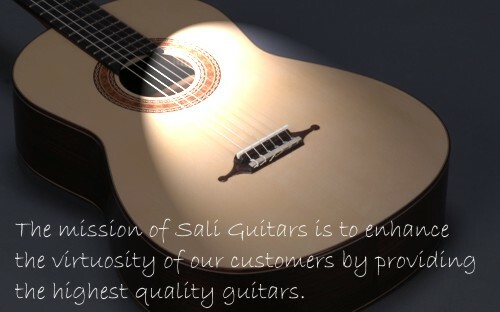 The sound of Sali guitars is defined by many factors, including design, quality of materials, and finish. We pay the highest attention to all of these factors. Perhaps the most important factor is the tuning of the guitar's resonator box using our proprietary frequency response adjustment. This is done individually because each guitar behaves differently due to inherent properties of wood. Consequently our instruments are extremely well balanced. Our unique innovation enables light sound boards and consequently strong response of a guitar. It also prevents significant sound board deformations due to string tension. In addition to relying on the long tradition of guitar making and handicraft, our instruments are designed and built based on scientific measurements that result in highly responsive guitars with the most beautiful consonant sound.